Transfer incentive program data directly to your CRM with CRM integration. Create a one-stop shop for access to sales and customer data. Want fluid customer data exchange with incentive program CRM integration? CRM integration allows you to maintain up-to-date, accurate sales and customer data across multiple platforms. 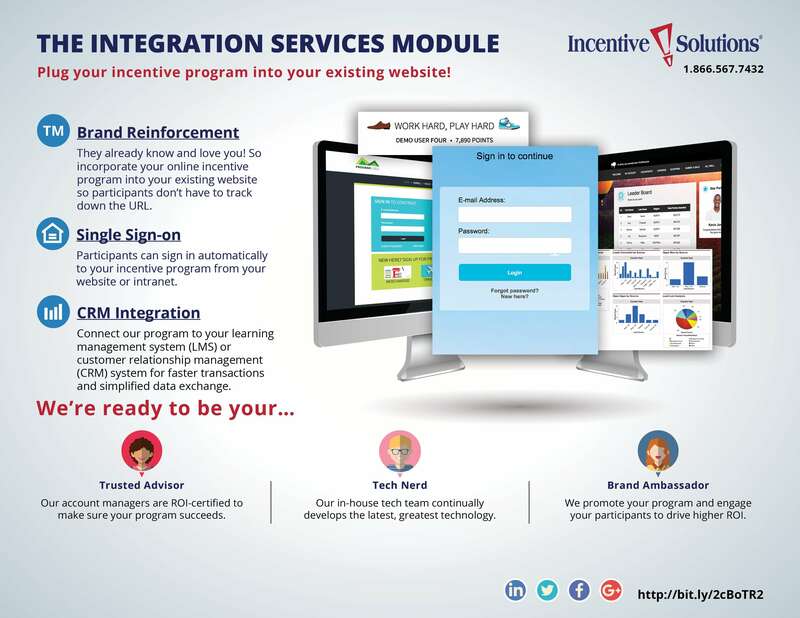 With our incentive program CRM integration technology, you can apply the sales and customer data you acquire from your sales incentive or channel loyalty program to your CRM platform and vice versa. This creates a one-stop shop for your sales and marketing teams to access the data they need to generate business! What are the features and benefits of CRM integration? Feed incentive program sales and customer data through an application program interface (API) into your existing business intelligence tools. Purchase history information, sales data and customer contact information from your rewards program help you develop a clear, complete picture of your customer base. Two-way data exchange allows you to transfer customer data from your CRM software to your incentive program. Customer data from your CRM program helps you create more effective communication campaigns and sales promotions in your sales incentive or customer loyalty program. When salespeople or customers earn points on your other online platforms, their points integrate automatically with your online rewards program. Your sales and marketing teams can access all sales and customer data in one convenient place. Which pain points does CRM integration help you solve? Which types of reward programs should use CRM integration? A channel incentive program is designed to increase selling and buying activity throughout your distribution network, which creates new sales data you need to capture. With The CRM Integration Module, you can make sure the valuable data created by incentive program activity makes it to your sales channel CRM software. You can manage multiple sales promotions using an online sales rewards program. That means you’ll have lots of sales data coming in through sales promotion activity. Feeding that sales data to your CRM system allows you to identify areas for sales strategy improvement or opportunity, while gaining better insight into your customer base. You can never have enough knowledge about what your customers need. When you integrate your customer loyalty program with your CRM platform, you motivate customers to purchase from you more frequently while controlling where all that new purchase data goes. Putting all the customer data pieces in one place gets you closer to a complete, 360⁰ view of your customer base. Which modules pair well with CRM integration? The Performance Tracking Module allows you to schedule, manage and track multiple, simultaneous sales promotions. Capture all the sales data coming in from those promotions using CRM integration! Learn more! Administer quizzes, surveys or daily trivia to your reward program participants with Learn and Earn. Transfer the resulting data to your CRM system with CRM integration to better understand customer satisfaction levels or training success. Learn more! This module keeps billing, activity reports and program access restricted to those who manage certain regions, departments or organizations in your incentive program. By pairing it with The CRM Integration Module, you can still gather incentive program data from the different pieces of your business network into one place. Learn more! Open enrollment allows anyone who accesses your public online rewards program URL to register. When you combine open enrollment and CRM integration technology, you capture that new enrollee data right away! Learn More! Using an incentive program leaderboard, you can track your top performers or customers. Using CRM integration technology, send that data to your CRM program to easily identify and learn more about your top salespeople or customers. Learn more!